A highly ornate climbing shrub to 6 8 feet (can be kept to 3 feet) and 8 12 feet wide from South Africa. It is evergreen and tolerant of temperatures to 25 F degrees briefly. The flowers are brilliant sky blue, about 1 inch across and completely cover the plant from March through October. 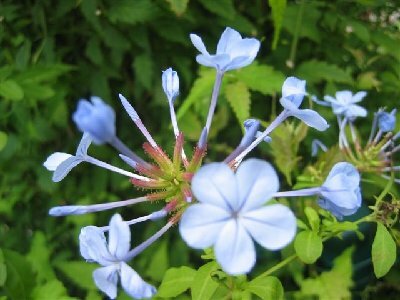 Plumbago is an excellent shrub in containers or inground. Full sun is required for best flowering, but can tolerate partial shade during the hottest part of the day. Blue Plumbago is very tolerant of salt air, for those who live near the coast. It required plenty of water and does not like to dry out. Fertilize 4 times annually with 2-10-10 for best flowering. Plumbago is fairly fast growing and should be pruned back once per year in early spring. Planting zones 9b - 11.